US Navy Honor Guard preparing for the service. 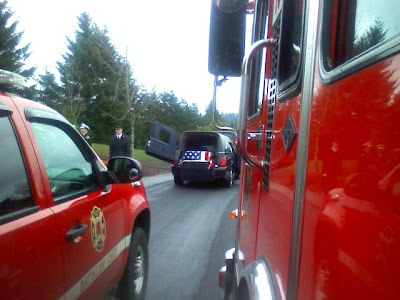 Portland Battalion 4 and Engine 10 frame the flag-draped casket. Portland fire personnel form up as the memorial is about to begin. In a light rain, Grandpa was laid to rest. 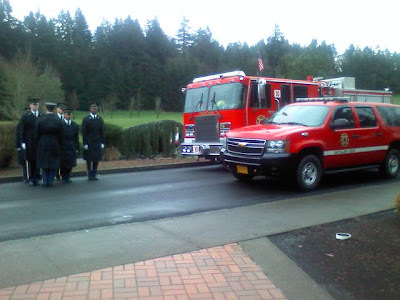 Portland Engine 10 traveled over 16 miles, through seven other station districts, to attend. Three chief officers were also in attendance, and one of the ACs present was the son of a retired AC who had previously worked with Grandpa Blue at Engine 10. He said his father was deeply saddened by the loss, and had shared several touching stories about him upon hearing he had passed. He also noted that there were currently only nine personnel (out of 702 sworn), who still work for Portland that had been on when Grandpa retired. I personally thanked each of the Portland guys for coming out, it meant a lot to me. The US Navy honor guard's 21-gun salute was the point I choked up. 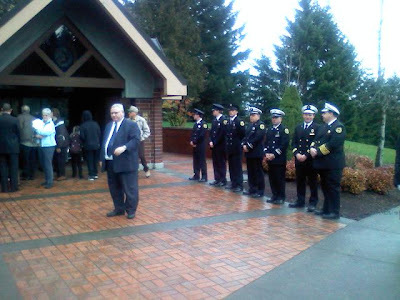 I was proud to attend in uniform and salute my grandfather along with the firefighters from Portland. And now, we get back on the truck, as he'd want us to do. First, a little more about my grandfather, something he never talked to us kids about, that Mom shared with us this week. Grandpa Blue, prior to his service with Portland Fire, served in the United States Navy and saw action during World War II. In fact, he was among those at the center of the action while serving on the destroyer USS Stormes when she was struck by a kamikaze, severely damaging the vessel and taking the lives of 21 sailors and injuring 15 others. The attack happened on the evening of the very first day that the newly-commissioned Stormes was in theatre for the first time. In a rare moment of talking openly about his experiences, he once told my mom about cutting through steel and bodies, after he had helped put down the fires, while making attempts to secure the ship afterwards. The Stormes was saved, repaired in drydock, patched up adequately to limp home on one shaft, and was eventually fully repaired and returned to duty. I was waiting for Spring, for the weather to warm up, before doing any serious work on Engine 17, but Mom asked me to consider bringing 17 to participate in the funeral detail. There isn't a lot that can be done on such short notice to pretty her up, but the single worst eyesore has been the partially-removed door markings, where the decals left some adhesive behind, and the hand-painted "GRANT COUNTY FIRE DISTRICT" had been crossed out with single lines of electrical tape (cheesy, I know, but it was what was available at the time, and I felt it important to be clear the rig was not representing Grant County when out and about). I called fellow firefighter and auto body guru Art Bonenfant this morning, asking if he could help me out on very short notice. Sure, he said, but only if you bring it right now. So of course, I did. The first thing I went to do after showing up at his place was remove the electrical tape. The tape had only been on a couple months, and not exposed to direct sunlight, but I'll be danged if it didn't pull up the paint under it, all the way down to the primer and in some cases exposing bare metal! Ouch!! Interestingly, it revealed no red under the lime-yellow, so when Grant County repainted her, they stripped her down right first. What was supposed to be a simple buff-off job got a lot more complicated, but Art was not perturbed in the slightest. I told him I didn't need perfection, because an entire repaint was in the future, I only hoped to make 17 marginally presentable for Monday's service. He set me to work with lacquer thinner to remove the adhesive residue from the decals, and pulled out some paints. From 30-40' away, he poured yellow into a paper cup, added a small dollop of green and a touch of white, stirred it, and then carefully regarded 17. He then dipped a stir stick into the green paint and dropped a single drop of green into the cup. Stirred. Regarded. Another drop. A drop of white. He did this for about ten minutes until he was satisfied and put it down. We set to buffing the lettering off without incident. 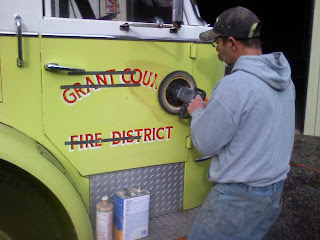 After the buffing was completed, I noticed evidence of where additional lettering had been placed by Grant County FD #5 on the bottom of the door, that had read "Moses Lake WA". I hadn't known about that. If you click on the picture below to full size, you can just barely make out some of that lettering. 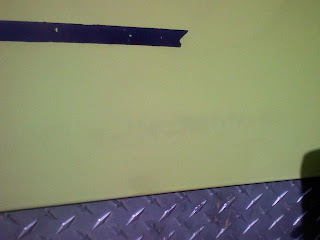 This pic also shows the severity of paint damage from removing the tape. We then masked off the doors, and Art laid down a heavy coat of his blend on top of the exposed metal/primer, to cover the dark strips. 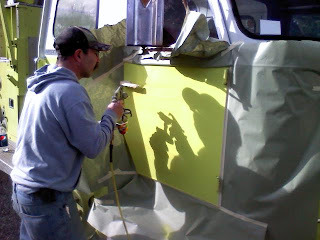 He then sprayed a wider band to blend the coloring, and finally sprayed a third coat over the entire door. He was done less than two hours after I showed up! While not a perfect perfect match, as you can see it was extremely close. I am hugely impressed with his ability to eyeball a color and put together a blend on the fly. So.... got that squared away. Give her a bath and she'll be ready to go on Monday. Art will eventually be getting 17 back, as he'll be the guy giving her back a beautiful red coat one day. I called Uncle Larry to let him know 17's would be coming along. I hadn't chatted with him at length yet, but to my delight he let me know that there would be a full Navy honor guard including 21 gun salute. Also, Portland Engine 10 and her crew would be in attendance. However, Mom hadn't known that no procession was included in the final arrangements, and as parking is at a premium where the memorial is being held, we agreed it would be best to not bring Engine 17 after all. Well, good progress was made anyway, and as the restoration continues, I will always remember the part that Grandpa Blue played in kicking me in the rear to get some work done on 17. Readying the pumper to honor him, even if it doesn't happen as I expected, will always represent the beginning of 17's road to restoration. Rest easy Grandpa, your detail is completed. We've got it from here. My last grandfather passed away yesterday, after suffering a stroke several weeks ago. His house was one of our favorites to visit as kids. The backyard was full of swingsets, teeter-totters, birdbaths, windmills and other decorations. The shed always had bikes and pedal cars ready to go, and other lawn toys such as frisbees, golf clubs and other fun stuff. Inside was an entire room set aside with bunk beds and toys, we could spend hours in there when visiting. Then of course, there was the mysterious attic and basement filled with treasures and curiosities awaiting discovery by adventurers. And the cats, he loved his cats. They had luxury window boxes, a cat tree to play in, and.... if I recall correctly, they weren't even his cats. They technically belonged to a couple of neighbors across the street... community cats, you might say. Anyway, he put up "Cat Crossing" signs and even painted a "Catwalk" on the pavement between the houses. That place was just magic. George Blue served with the Portland Fire Bureau (now Portland Fire & Rescue) for a very long time, spending almost all of his career as chauffeur and engineer of Engine 10. When he started there, Engine 10 was still a 1926 American LaFrance 1,000 GPM pumper. Among other family legends is the time he tore the station bay door apart when it started to come down as 10's was heading out on a call. Hey, eventually we all get dinged by bad luck, right? Grandpa Blue lived to the age of 88, surviving two previous wives who passed before him. I visited him a little over a week ago, and even weakened by the stroke, he quizzed me on pump pressure settings on different hose sizes, compensating for elevations, and I told him about my Engine 17, which tickled him. He had expressed interest in me taking him for a ride when he got out of the hospital. I knew things were not going that well for him, but his passing still came surprisingly earlier than expected. Details are still in the air, but I fully expect to be driving Engine 17 in his procession. Hug your family. Make that phone call you've been putting off. All that. I've alluded to the other rig at my house, but it was pointed out to me that I never really elaborated on it. Since we are in the winter offseason, here's some more filler content disguised as a useful blog post. I have served on four fire departments as I have moved around the country (five agencies if you count my two years concurrently serving as a wildland firefighter with the State of Minnesota). I've been in the job since 1993, but have been a probie four times. Hopefully never again, as it gets old starting over, and I'm not very good at keeping my mouth shut about "at the other place we ...", and even I hate it when other guys do that. I joined a mid-sized county fire protection district, upon the return of my family to the Pacific Northwest. It is a primarily volunteer fire department, but there are a handful of career members and several part-timers, who help fill the gaps when volunteers and live-in residents are not available. Last year, the fire district opened a new "satellite" station, the district's sixth fire station. The new location filled in the last major coverage hole in the district. It's not like we have career guys ready to staff the place, but the district wanted something more than a shed on the corner for a few apparatus to sit in. Besides, the district recently experienced the difficulty of selling old fire stations after a new headquarters was built and another station was overlapped by a city annexation. It's hard to sell an old fire station. In fact, we ended up keeping the overlapped station (for now), as it didn't sell and is now being used for other purposes. So, instead of just building a 'shed' that required duty crews to go check on the rigs, maintain the building, and mow the grass at least weekly, the district bought an existing home in the right location and intends to put up a two-bay building for the apparatus by the house. In the future, should district/station reconfiguration happen again, selling an existing house with a big garage will be comparatively easy. And as long as there is a house, the district realized that a live-in resident firefighter can do all the rig checks, grounds maintenance, building maintenance, deter vandalism and theft... and when home, run a few calls to boot. Saves the district a bundle on the hourly costs of sending duty crews to do the work when they could be doing other useful things. I applied for the resident position, and was blessed to be selected. So I live, with my family, in Fire Station 6. I don't pay rent, but I earn my keep by doing all the above mentioned tasks, and running calls when I'm home. It's a lot of work, but it's worth it to me. I still have a full-time job, which is also true for most of the other resident firefighters living in dorm rooms in some of the other stations. When we're around, we help, and if not, the next closest staffed station and nearby volunteers pick up the slack. The building is not yet completed, so for now I am assigned just an EMS/brush 'rescue squad' kind of mini-pumper vehicle (Squad 6) which fits in the existing space at the station. When the planned building is completed, Squad 6 will tentatively be joined by an engine, though exact plans are still up in the air on exactly what the district will do for Engine 6 as yet. 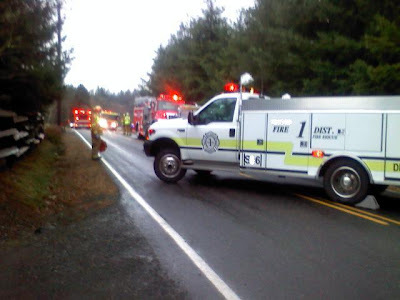 I had a moment to snap a picture of Squad 6 while out on a traffic accident today. This is my 'take home' vehicle. It's my baby. I absolutely LOVE this little truck, it can do a lot and fill many roles comparative to its small size. 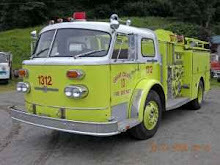 Thus, Engine 17 was actually the second fire apparatus to live at my house.... at Station 6. But to be absolutely clear, Engine 17 is not in service and will never be utilized as a district apparatus. It is not certified for that use, is too old to be accredited by a fire insurance company, is not equipped, and I would almost for sure be asked to pack my belongings if I tried that stunt anyway! 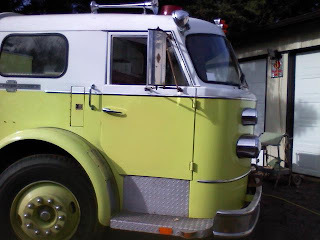 Necessarily, I talked with the neighbors (all really great people) so they understand that the old American LaFrance fire engine is not a district rig, not in service, and not coming to their fire, so please don't get angry at the district when it doesn't show up. Winter. Not the time to be doing much with Engine 17. Yet I feel compelled to put something up once in a while so you know this thing is still on. The reaction to the Facebook fan page pretty much blew me away. Over 80 fans in just a few weeks, and I only know and recognize a small handful of them. To the rest of you, welcome aboard. I hope I can entertain you adequately to make it worth your time, because I don't have any door prizes to offer. 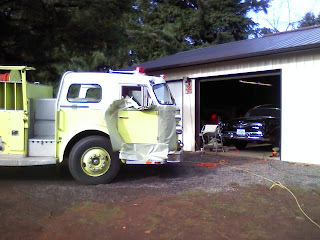 Finally got the last photo installed at the Wikipedia entry for American LaFrance, after securing permission from the owner of the photo. The Century 1000 pumper now included on that page was retired from a North Carolina department and subsequently sold to a collector.... in Germany. Of course, he's a member of the ALF Owners group as well as the European chapter of SPAAMFA. Anyway, where the Century 1000 is placed on that article, Engine 17 sits above it, and some mystery guy (cough) stands in front of a Century 2000 below it. Still waiting and hoping to get pictures of 17 from her earlier days. Have not heard back yet, but don't want to nag too hard. My sister recently related some miscellaneous events to me that she experienced in Tacoma with her involvement in the fire buff's club and TFD staff, and running into old acquaintances from years ago (talking about you, Joseph Stiles!). I am chagrined to admit that, over fifteen years after I moved away from Tacoma, there are new kids on the TFD that have heard about my outrageous overzealous goofball stuff from back in the day. Does that make me a legend? If so, it is certainly the wrong kind of legend! That I 'grew up' to join the service, was even an officer for a while before getting tired of the game that goes with it, currently live in an active 'satellite' fire station in my six-station fire district with my family (yes, they give me my own district apparatus to keep at the house.... are they crazy?). Who would have ever thought I would be, well, useful? Or at least not dangerously stupid? Somehow, with tall credit to the guys in Tacoma who against all odds kept me from getting myself killed... here I am. Still, owning a fire engine is a bit nuts, I admit. I just know how to hide it, I guess.